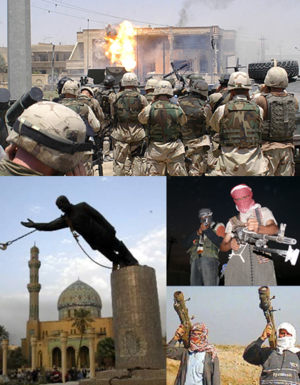 Clockwise from top: U.S. troops at Uday and Qusay Hussein's hideout; insurgents in northern Iraq; an Iraqi insurgent firing a MANPADS; the toppling of the صدام حسین statue in Firdos Square. Killed:' 1,002+ Total dead: 25,285 (+12,000 policemen killed 2003–2005)""
↑ "The JRTN Movement and Iraq's Next Insurgency | Combating Terrorism Center at West Point". Ctc.usma.edu. Archived from the original on 2011-08-26. Retrieved 2014-08-02. ↑ Operation Iraqi Freedom. iCasualties. آرشیولنیب اصلی نۆسخه‌دن on 21 March 2011. یوْخلانیلیب24 August 2010. ↑ ۵٫۰ ۵٫۱ Office of Workers' Compensation Programs (OWCP) – Defense Base Act Case Summary by Nation. U.S. Department of Labor. یوْخلانیلیب15 December 2011. ↑ ۶٫۰ ۶٫۱ T. Christian Miller (23 September 2009). U.S. Government Private Contract Worker Deaths and Injuries. Projects.propublica.org. آرشیولنیب اصلی نۆسخه‌دن on 27 July 2011. یوْخلانیلیب23 October 2010. ↑ "Amnesty: Iraq holds up to 30,000 detainees without trial". CNN. 13 September 2010. Archived from the original on 23 October 2010. Retrieved 6 January 2011. اینگیلیسجه ویکی‌پدیاسی‌نین ایشلدنلری طرفیندن یارانمیش«Iraq War»، مقاله‌سیندن گؤتورولوبدور. ( ۲۸ سپتامبر ۲۰۱۸ تاریخینده یوْخلانیلیبدیر). قارداش پروژه‌لرده عیراق ساواشی (۲۰۰۳-۲۰۱۱) گؤره داها آرتیق بیلگی‌لر تاپابیلرسینیز. بۇ صفحه‌‌ سوْن دفعه ‏۹ آوریل ۲۰۱۹، ‏۰۷:۵۲ تاریخینده دَییشدیریلمیشدیر.